Digital Earth Resistance Tester, 3 ½ digits Electronic Digital Earth Resistance Tester designed for measurement of the resistance of earthing used in the electrical equipment as well as for measurement of ground resistivity. It can be used for measurements of the other low regular, liquid resistances, voltage AC, voltage DC and electrical resistance. This Earth Resistance Tester finds wide application for testing earthing installation in power based industries, telecommunication networks and electrical traction systems, etc. 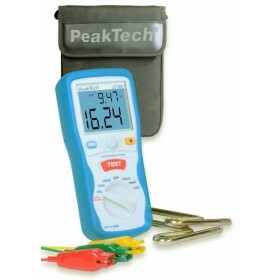 Digital Earth Resistance Tester, 3 ½ digits Rugged sealed digital earth tester built with all the protection you need for outdoor use. The instrument is suitable for the testing of single earth electrodes such as lightning conductors and other small earthing systems according to VDE 0413. The resistance of conductors and coupling joints can also be measured. Two-terminal operation measurement, which reduces the accuracy, can also be done by shorting P and C terminals. It has an advanced circuit design that permits the instrument to operate with the minimum influence from earth voltage and earth resistance of the auxiliary spikes. The calibration of the instrument is performed with the included test leads.